Life in Casa Blanca feels as if you were in a dainty sailing boat, its soothing white color echoing the sails of a luxury vessel and blue notes here and there reminding you that the sea can be looked from everywhere in this fabulous villa in Las Catalinas. Whether in either of its two master suites, its lovely terraces, or the living-room, this Guanacaste vacation home is embraced in such a way by the Pacific Ocean you can almost taste it. The main living area is the heart of this Costa Rican vacation rental, all in white and full of windows that open to the sea, letting the ocean breeze permeate its fully-equipped kitchen, the dining space, and every single corner of the house. If you’d rather be outside, treat your friends and family to seafood on the grill in one of its two terraces, right by a plunge pool. Its two wondrous master suites, each with an ensuite bathroom, offer unequaled views of the sea, but every single room in this lovely Costa Rican beach house is a treat, with the two bedrooms on floor level also offering ensuite bathrooms, ocean views and lavish beds. One of them also has its own outside entrance and kitchenette. 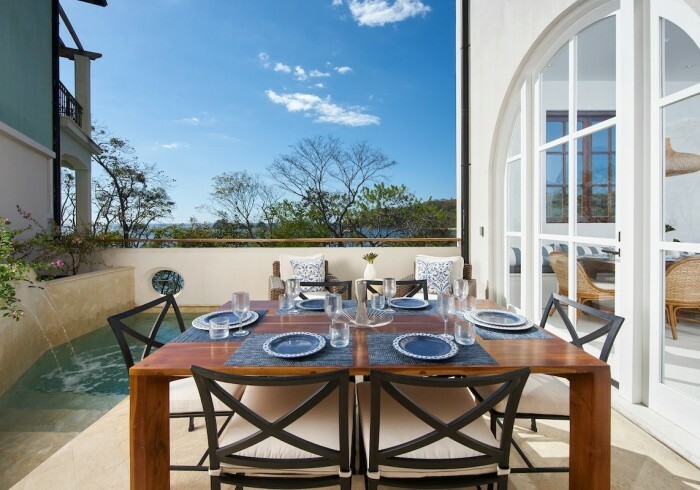 A unique blend of classic and modern beach elements, in an exceptional location with gorgeous views and literally less than twenty steps from Las Catalinas Beach Club, this fantastic rental home in Costa Rica accommodates up to ten guests. Children are welcome. Embrace the comfort of a private luxury villa in a picturesque setting and experience the wonders of Costa Rica the way it’s meant to be. Enjoy the privacy and quiet of your own home in Guanacaste with our signature House Mom service and let our dedicated concierge team help plan your vacation so that your stay in paradise goes above and beyond your expectations.